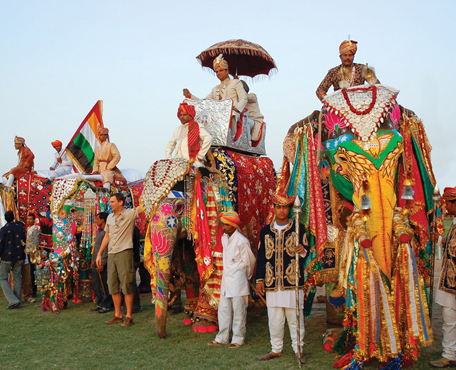 Rajasthan is a most colorful and interesting part of India, which has been a main attraction of tourist. Culture of Rajasthan is entirely different, Dressing of men and women is really worth seeing. Rajasthan if full of heritage monument, which is existing example of gorgeous architecture. The Forts of Jaipur, Jodhpur, Jaiselmer are very attractive. A part from this you can visit the Puskar is very small but this is the place where you find the temple of Lord Brahma. And Udaipur city of lake is very clean and beautiful city, so this way enjoy the Majestic Rajasthan. If you are arriving in Delhi, our representative receive you at airport and transfer to hotel, rest for a while and proceed for city sightseeing, India Gate, President house, Kutub Minar, Red fort, Connaught place circle, heart of city, back to hotel and rest over night. Have the breakfast and proceed for Agra city of Taj, After reaching, visit Taj Mahal, Red fort, Baby taj, mejtab bagh back side of river sunset point, night stay in pre booked hotel. Have the breakfast, proceed for Jaipur on the way visit Fatehpur Sikri, the desert city in old time it was capital of Mughal, then Galta ji temple in Jaipur and after that check in hotel and rest. Have the breakfast and proceed for city excursion, Amber fort, Jal mahal, City palace, Hawa mahal, and walk in open market at evening, then rest overnight in hotel. Have the breakfast in hotel and proceed for Puskar holy city, here you can visit temple of Lord Brahma and small lake, then walk in open Bazaar, and night stay in hotel. Have the breakfast and proceed for Udaipur, After reaching city visit the Fateh sagar lake with stunning water at evening and rest over night in pre booked hotel. After the breakfast in hotel and proceed for excursion City palace, Jagdish temple, Saheliyon ki badi, Shilpgram, Pichola lake and overnight in hotel. Have the breakfast and proceed for Ranakpur, here you can visit the Jain temple, splendid architecture and rest over night in hotel. Have the breakfast in hotel and proceed for Jodhpur, visit the Mehrangarh Fort in Jodhpur, Jaswant thada, clock tower, spice market, and old city town, rest over night in hotel. Have the breakfast and proceed for Jaiselmer, after reaching check in hotel and visit Fort at evening and rest over night in hotel. Have the breakfast and proceed for city excursion, the go for Camel safari, at evening and enjoy the night stay in desert and fork dance. Have the breakfast and proceed for Bikaner, after reaching Bikaner check in hotel and visit the Fort, see some village life, night stay in hotel. Have the breakfast and proceed for Mandawa, on the way visit karni mata temple, after reaching Mandawa check in hotel visit old Haveli and night stay in hotel. Have the breakfast proceed for Delhi, and rest in pre booked hotel. Or transfer to airport, have the flight.